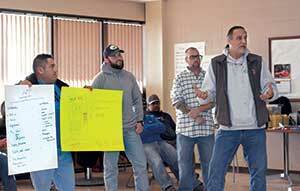 Timberline employees present new ideas and initiatives to management. 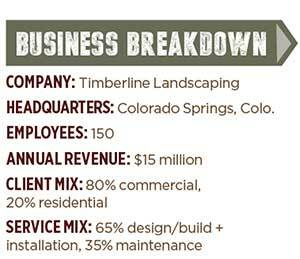 The team at Timberline Landscaping in Colorado Springs, Colo., created an in-person opportunity for employees to pitch ideas to help the company grow strategically. Sound familiar? The company modeled the initiative after the hit TV show “Shark Tank,” on which entrepreneurs pitch their business ideas to celebrity business people in an effort to get them to sign on as investors. At Timberline, the ideas were so good that the company had a difficult time narrowing them down to the ones they wanted to implement, according to Stephanie Early, Timberline’s chief strategic officer. The “Shark Tank” concept came about after Timberline partnered with a consulting firm, on a yearlong strategic planning journey. Early says Timberline’s management team sought a way to involve team members from all levels of the company in the process of idea generation and execution. The company hosted a leadership training meeting that lasted several days. Team members learned about strategic planning and strategic and innovative thinking, Early says. The leadership training was offered for leadmen on up. Eighty Timberline employees participated in the session. “The three days of training wrapped up with our ‘Shark Tank’ presentation in which everyone had a chance to present ideas on ways they’d like to see the company grow,” Early says. Some ideas related to company culture, others touched on sales and some addressed productivity. From there, the C-suite executives selected four initiatives to pursue. The four ideas chosen include a Spanish/English culture initiative that would focus on better integration of the Spanish-speaking crew members (with English classes as an option); the creation of the company’s own material yard; a production team focused on efficiency strategy; and “Timberline You-niversity,” the company’s training initiative, which focuses on building a career pathway for company team members. After the C-suite selected the four initiatives, Early says the company took volunteers who were willing to help implement the ideas. There are now four “Shark Tank” committees, one for each initiative chosen. The committees initially started meeting biweekly but have since scaled it back to monthly. Early says crew members can leave the field to attend the committee sessions, which are typically held close to the end of the day. At press time, the company was about to launch its first English class. About 35 people are signed up to take English classes—10 in an intermediate class and the rest in a beginner-level class. The class is geared toward landscape-related terms and basic conversational skills. Though the company is still working on getting these initiatives underway, Early says the team is discussing making “Shark Tank” a regular occurrence—possibly as often as twice a year. She says it never hurts to generate new ideas. In fact, managers kept the list of the initial 30 ideas that were presented. Early says the biggest investment for the “Shark Tank” initiative has been time, such as the three days of leadership and strategy training. Her advice for a company looking to do something similar is to invest in its people. She says if Timberline’s management hadn’t involved employees in training that focused on how to think innovatively, the “Shark Tank” idea may not have been so successful. Early also says it’s important to recognize that quality ideas come from anywhere—and it’s vital to include field staff in the efforts to implement them.